Above: Tank magic! I went scouting The Tank Museum near Beijing to learn more about tanks. Photo gallery below. Beijing sky was not quite Olympic blue when I started afternoon trip to Tank Museum in YangFang which is in ChangPing county north of Beijing. From Beijing center it took 1,5 hours drive to museum which is outside Ring-6. On the way to Tank Museum I passed a cemetery which was placed alongside the railroad bank. Road was partly for-SUVs-only condition, but new road was already under construction. 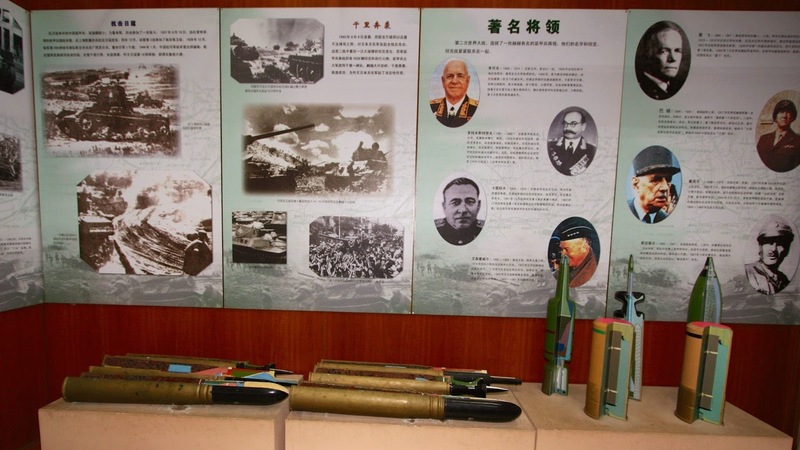 Tank Museum belongs to NanKou area which is considered as ultimate gate for Beijing. Long ago when China and Soviet Union had major troubles, this area was militarily important and busy. 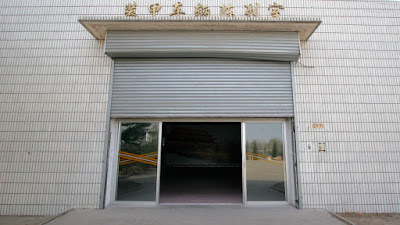 Now there is tank maintenance area, Foton truck factory, and iron, cement and construction material industries. Tank Museum has over 40 tanks on show from their collections. Some halls contained newer material but were not open for visitors. Museum has average 30 visitors per day. During my visit I didn't see other visitors. I got a personal guide who helped me to do the tour. She was a student but able to clarify many details and items which didn't have info panel. She was excited about experimental tanks and the science in them. We communicated by Mandarin and English. Two hours was enough to walk the Tank Museum through. I shot 300 pictures. 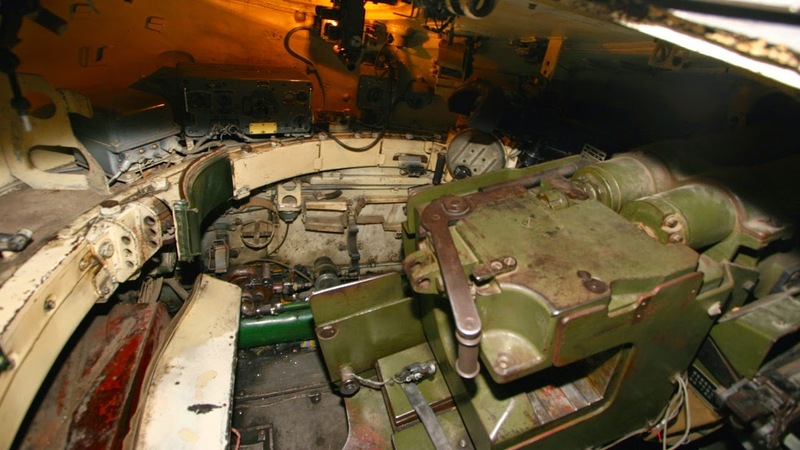 I visited inside a battle tank. I tested the spade once used by Chairman Mao ZeDong. And I had tankTalk with uniformed guard. 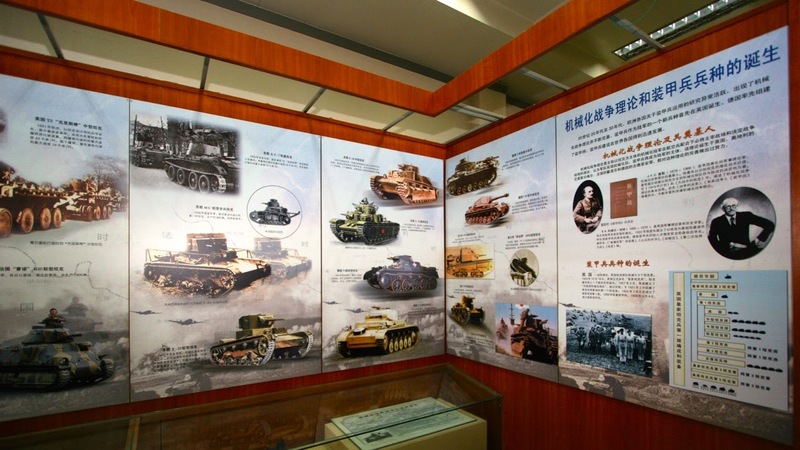 Tank Museum China offers perspectives for military historians and games designers. But nothing for Valkyries to take to Valhalla, instead there was 9-life cats. 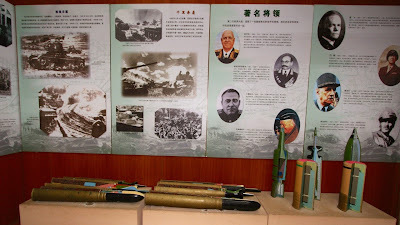 These pictures were taken on April 6th, 2008 at The Tank Museum China. Info panel texts are original. I used Canon EOS with EF-S 10-22mm and Speedlite 580EX. Click pictures to enlarge. Above-1: On the way to The Tank Museum China. 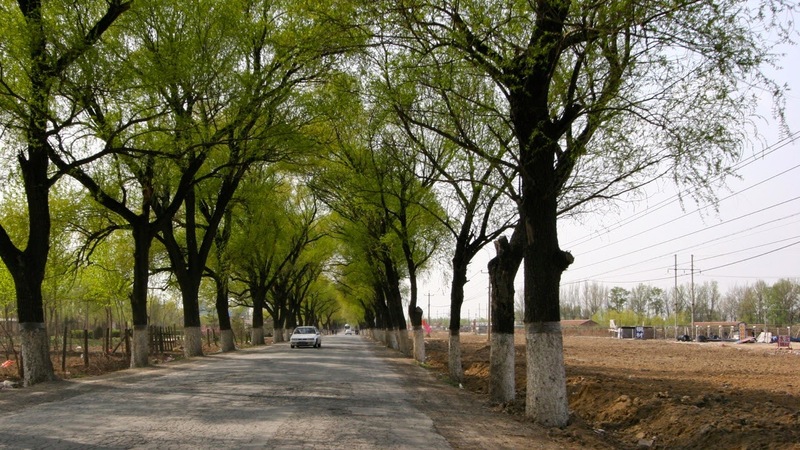 Located in YangFang, Changping county, north of Beijing. Above-2: The Tank Museum China. Gate. Above-3: The Tank Museum China. In front of the main building. Type 96 Main Battle Tank (China). Picture 1/4. Above-4: The Tank Museum China. In front of the main building. Type 96 Main Battle Tank (China). Picture 2/4. "The Type 96 Main Battle Tank is the latest development of Type 88 MBT of China, featured a welded turret. Its main armament is a 125mm smooth bore gun fed from an automatic loader. It has a crew of 3, is fitted with an independent lower reflection type image stabilized fire control system, second generation low light level night sight, and VCR-8000 Radio set. The Type 96 MBT also attended the 50th anniversary parade of People's Republic of China on October 1, 1999, and accepted gloriously inspection of the Chinese national and party leader." Above-5: The Tank Museum China. In front of the main building. Type 96 Main Battle Tank (China). Picture 3/4. Above-6: The Tank Museum China. In front of the main building. Type 96 Main Battle Tank (China). Picture 4/4. Above-7: The Tank Museum China. Above-8: The Tank Museum China. Inside the main building. General Xu GuangDa (1908-1969), Commander of China's Tank Forces. Above-9: The Tank Museum China. Above-10: The Tank Museum China. LVT (A)-4 Carabao Amphibious Tank (United States). Picture 1/4. "LVT (A)-4 is an amphibious tank produced in 1940s by the US FMC Corporation, mainly used by the tank units and marine corps. This vehicle is designed for coast landing, forced river crossing, and combat in the areas of water and rice fields. LVT (A)-4 entered production in August, 1943, and a total of 1980 vehicles had been built. In 1944, LVT (A)-4 took part in the battle of Saipan island in Pacific Ocean for the first time. In 1954, the US Army deployed the vehicle in Vietnam for combat in the areas of water and rice fields. The LVT (A)-4 in service with PLA of China (being phased out service already) were captured from Kuomintang Army in the Liberation War. Specifications. Combat weight 18t. Crew 6. Armament (main) 1*75mm howitzer. Max road speed 26km/h. Max water speed 11km/h. Max range 240km." Above-11: The Tank Museum China. LVT (A)-4 Carabao Amphibious Tank (United States). Picture 2/4. Above-12: The Tank Museum China. LVT (A)-4 Carabao Amphibious Tank (United States). Picture 3/4. Above-13: The Tank Museum China. LVT (A)-4 Carabao Amphibious Tank (United States). Picture 4/4. Above-14: The Tank Museum China. T-34 Tank Recovery Vehicle (former Soviet Union). "T-34 Tank Recovery Vehicle is a technical support vehicle produced in 1940s by former Soviet Union. 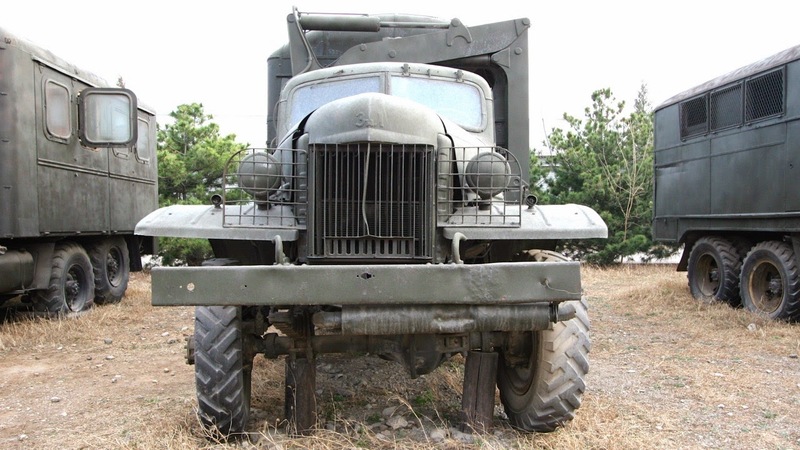 This vehicle began to enter service with Soviet Union Army in 1940, and withdraw from service in the late 1960s. T-34 Tank Recovery Vehicle, as a support vehicle for T-34 Tank, is used for towing and recovering the trapped and tippled tanks or damaged tanks in the war. In 1950s, China began to buy this vehicle and put them in to service with PLA Army, now all the vehicle were phased out of service. 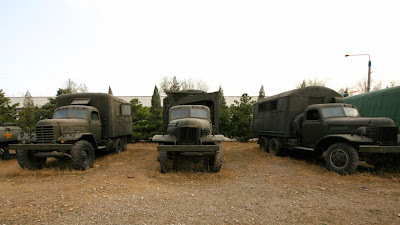 The vehicles bought by China over went into the front line of Korean War together with Chinese voluntary troops, and played a significant role in the technical support in the war. Specifications. Combat weight 22-25t. Max speed 55km/h. Max range 300km. Max traction 1584N(14t). Armament 1*7,62mm machine gun." Above-15: The Tank Museum China. INFO PANEL for T-34 Tank Recovery Vehicle (former Soviet Union). - Add cleaning info panels to To-Do List! Above-16: The Tank Museum China. CY-100 Medium Self-Propelled Gun Tank, SPG (former Soviet Union). "Function: It is designed to accompany the infantry and armor in the battle, to provide fire support and destroy the enemy's armored vehicles. Specifications. Combat weight 31,4t. Crew 4. Max road speed 55km/h. Max range 300km. Armament (main) 1*100mm cannon. Armor thickness 20-90mm." Reader comment: SU-100 Samokhodnaya Ustanovka self-propelled gun. Above-17: The Tank Museum China. 1. CY-100 Medium Self-Propelled Gun Tank, SPG (former Soviet Union). 2. Type 63-I Amphibious Light Tank (China). Above-18: The Tank Museum China. Type 63-I Amphibious Light Tank (China). Combat weight 19,83t. Armament (main) 85mm. Length 8,44m. Width 3,2m. Max speed 64km/h. Max range 340km. Armament 1*7,62mm machine gun. Engine 12-cylinder 4-stroke in-line water-cooled diesel 402hp. Reader comment: Type 63-I Light Tank. Above-19: The Tank Museum China. Type 59B Medium Tank (China). Picture 1/2. "The Type 59B Medium Tank is a medium tank developed in China since 1980. It is finalized and entered service in 1984. This tank is a further development of Type 59 Medium Tank incorporating new technology and new components. Compared with Type 59 Medium Tank main improvements include laser ranger finder, automatic range setting system, new 105mm rifled tank gun, and automatic fire extinguishing and explosion suppression system. Specifications. Combat weight 28t. Crew 4. Max speed 50km/h. Max range 540km. Armament (main) 1*105mm rifled gun." Above-20: The Tank Museum China. Type 59B Medium Tank (China). Picture 2/2. Above-21: The Tank Museum China. Storm 1 Main Battle Tank (China). Picture 1/3. 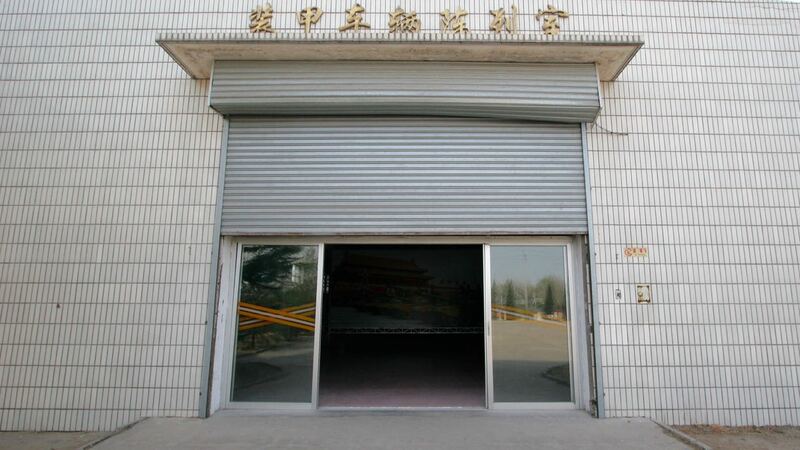 "In 1980, a tank manufacturer in China developed two tank prototypes i.e. Storm 1 and Storm 2, for a middle east state, both which had been demonstrated and tested overseas, but had never been type finalized for unknown reasons. Storm 1 MBT features welded turret. Its chassis is almost identical to that of Type 80 MBT. Main armament consists of a 105mm rifled extended tank gun. This tank looks alike the China's new MBT in appearance." Above-22: The Tank Museum China. Storm 1 Main Battle Tank (China). Picture 2/3. Above-23: The Tank Museum China. Storm 1 Main Battle Tank (China). Picture 3/3. Above-24: The Tank Museum China. Type 69 Medium Tank (China). Picture 1/2. "The Type 69 Medium Tank, a battle tank produced in China in 1970s, is the further development of Type 59 Medium Tank. It is also the first medium tank of China's indigenous design instead of imitation. This tank features strong firepower, high mobility and good protection. Compared with similar foreign tanks, it is much better than Type 61 Tank of Japan in overall performance, exceeds M60 MBT of USA in protection and mobility, and is almost identical to the former Soviet Union's Type 55 Tank in each specification. Specifications. Combat weight 36,5t. Crew 4. Max road speed 37km/h. Max range 240km. Armament (main) 1*100mm smooth bore gun, (auxiliary) 3*7,62mm machine gun, 1*12,7mm anti-aircraft machine gun." Above-25: The Tank Museum China. Type 69 Medium Tank (China). Picture 2/2. Above-26: The Tank Museum China. Type 80 Main Battle Tank (China). Picture 1/3. "The Type 80 Main Battle Tank is the second generation main battle tank in China developed successfully in 1980s following Type 59 and Type 69 MBT, with performance in firepower, mobility and protection much better than that of first generation MBT. Type 80 MBT adopts light spot injection fire control system, can engage moving target while on short halt. Specifications. Combat weight 38t. Crew 4. Max road speed 60km/h. Max range 430km. Armament (main) 1*105mm rifled gun." Above-27: The Tank Museum China. Type 80 Main Battle Tank (China). Picture 2/3. Above-28: The Tank Museum China. Left: Type 80 Main Battle Tank (China). Picture 3/3. Above-29: The Tank Museum China. 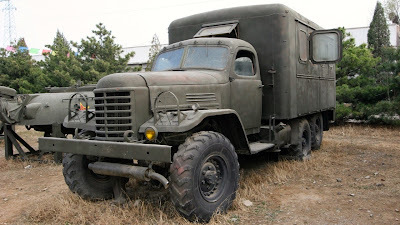 Type 64 Tank Tractor (China). Picture 1/2. "The Type 64 Tank Tractor, developed in China based on the Type 59 Medium Tank, is a transient engineering vehicle for emergency use. 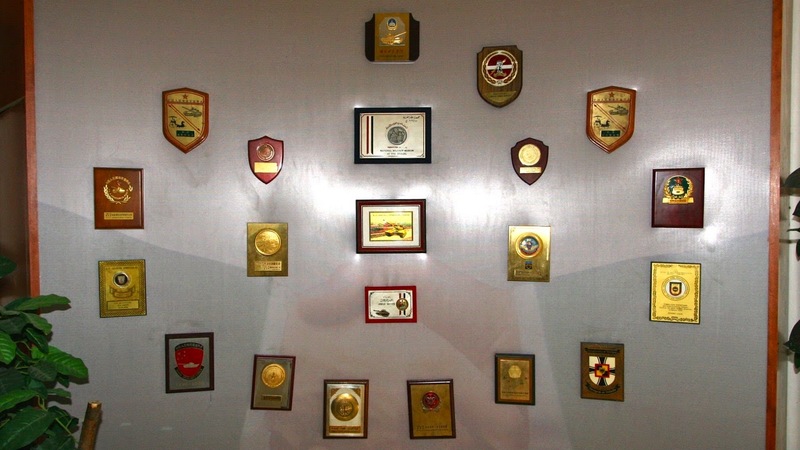 It mainly equips the technical support unit of tank division regiment, carrying out peace time and war time technical support missions. Specifications. Combat weight 28t. Crew 2+3. Max traction 14-14,5t. Max towing capacity 35-40t. Armament 1*7,62mm front machine gun." Above-30: The Tank Museum China. Type 64 Tank Tractor (China). Picture 2/2. Above-31: The Tank Museum China. 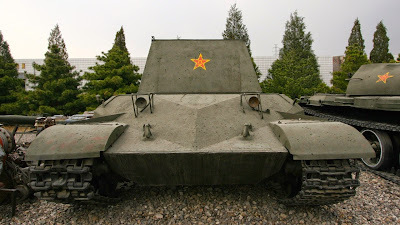 Type 63 Tracked APC (China). Picture 1/2. "The Type 63 Tracked APC is a tracked armored personnel carrier produced in 1960s by China. As a main weapon system for the mechanized (motorized) infantry of the tank unit, it is mainly used for transporting infantrymen, ammunition and material. This vehicle is also in service with some countries in Asia and Africa. The production of this vehicle ceased in 1985. Specifications. Combat weight 12,8t. Crew 2+13. Max road speed 60km/h. Max water speed 6km/h. Max range 500km. Armament 1*12,7mm anti-aircraft machine gun." Above-32: The Tank Museum China. Type 63 Tracked APC (China). Picture 2/2. Above-33: The Tank Museum China. Type 70 130mm self-propelled Rocket System (China). Picture 1/2. "The Type 70 130mm self-propelled Rocket System was a product of 1970s in China. 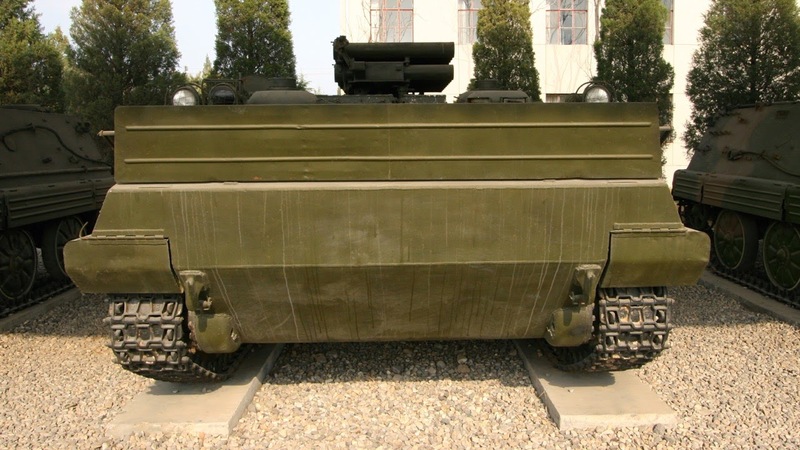 It was developed based on the Type 63 APC's chassis and incorporated the Type 63 130mm rocket system's barrel assembly and launching mechanism, integrating the chassis and rocket system with the hydraulic elevating mechanism. It is designed to field the artillery unit of the tank (mechanized) division regiment, to provide fire support, suppress and destroy the enemy's weapon and effective strength. Specifications. Combat weight 13,4t. Crew 2+4. Max road speed 55km/h. Max range 500km." Above-34: The Tank Museum China. Type 70 130mm self-propelled Rocket System (China). Picture 2/2. Above-35: The Tank Museum China. Above-36: The Tank Museum China. Type 85 Tracked Armored Personnel Carrier (China). Picture 1/2. "The Type 85 Tracked Armored Personnel Carrier (APC) is a new base armored personnel carrier developed in 1984 in China. More than 10 variants are developed based on the Type 85 APC's chassis, forming the Type 85 APC family. Compared with the Type 63 APC, the Type 85 APC and its variants are much better overall performance, featured by being simple in construction, enhanced reliability and improved mobility. Specifications. Combat weight 13,6t. Crew 2+13. Max road speed 65km/h. Max range 500km. Armament (main) 1*12,7mm anti-aircraft machine gun." Above-37: The Tank Museum China. 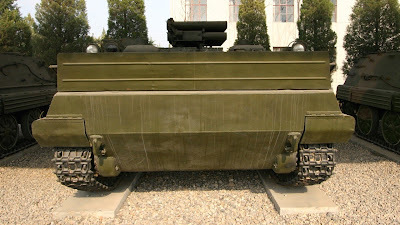 Type 85 Tracked Armored Personnel Carrier (China). Picture 2/2. Above-38: The Tank Museum China. Radar and Command Vehicle (United States). Picture 1/2. "This vehicle, captured from Kuomintang Army in the Liberation War by the PLA of China, was produced in US. In 1949, the first Field Army of PLA employed this vehicle for many times in the operations for liberating Lanzhou, Xiying, and Yinchuan. On top of the vehicle there is a radar, at the rear there is fitted the generator and winch. This vehicle is a multipurpose tracked support vehicle for commanding operation." Above-39: The Tank Museum China. Radar and Command Vehicle (United States). Picture 2/2. Above-40: The Tank Museum China. M5A1 Light Tank (United States). Picture 1/2. "M5 Series Light Tank was a light tank developed in 1940s in US. It was the successor to the M3 Series Light Tank, also designated Stuart 6. The M5 Series Light Tank includes M5 and M5A1 among which the M5 had never entered service while M5A1 entered service in 1943. 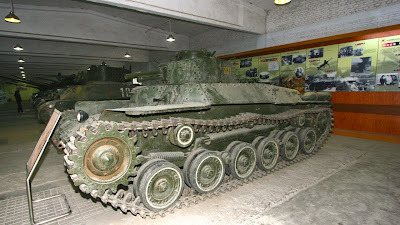 The M5A1 Light Tank in service with the PLA was the trophy captured from Kuomintang's Army in the Liberation War. After liberation, this light tank gradually withdrew from service. Specifications. Combat weight 16t. Crew 4. Max road speed 64km/h. Max range 257km. Armament (main) 1*37mm gun." Above-41: The Tank Museum China. M5A1 Light Tank (United States). Picture 2/2. Above-42: The Tank Museum China. Above-43: The Tank Museum China. 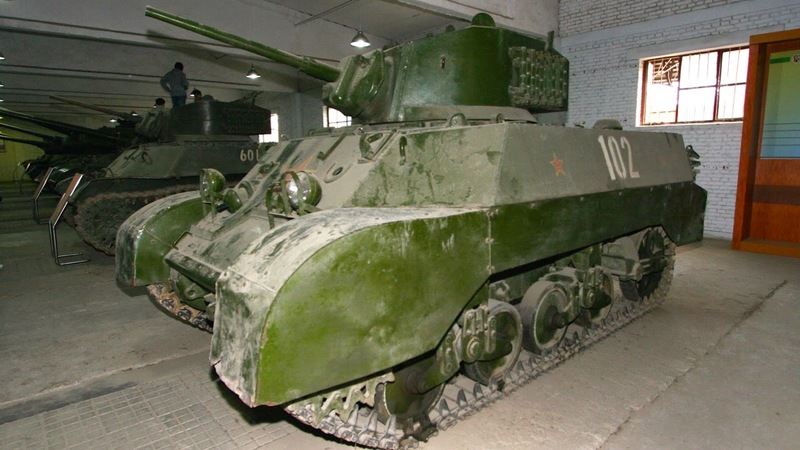 M3A3 Prop Tank (China). "Movie Star". Picture 1/2. 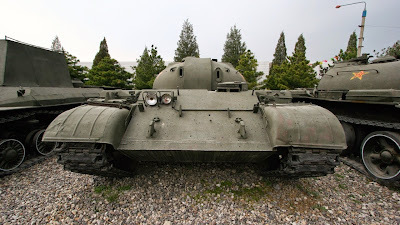 "The M3A3 Prop Tank was developed based on the chassis of USSR CY-76 self-propelled gun and the turret of the US M3A3 Light Tank, mainly used for shooting of movies and TV plays. 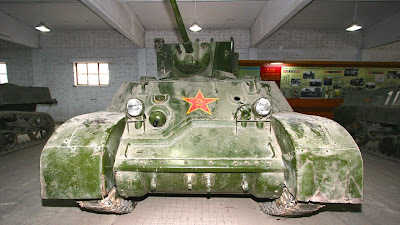 This tank ever took part in the shooting of more than 10 war movies such as Jinan Campaign and Crusading from South to North. CY-76 self-propelled gun has a combat weight of 11,2t, max speed of 45km/h. The M3A3 Light Tank has a combat weight of 14t. Its armament consists of a 37mm gun and 47,62mm machine guns." Above-44: The Tank Museum China. 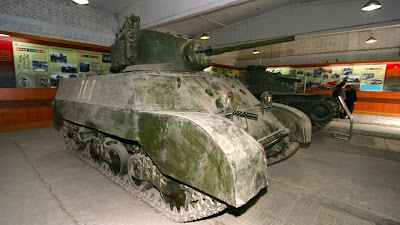 M3A3 Prop Tank (China). "Movie Star". Picture 2/2. Above-45: The Tank Museum China. • M3A3 Prop Tank (China) called "Movie Star"
Above-46: The Tank Museum China. Type 59 Medium Tank (China). Picture 1/4. "The Type 59 Medium Tank produced in the late 1950s by China. The first 33 production vehicles attended the 10th anniversary Parade on October 1st, 1959. This tank is a main assaulting weapon system in the land warfare, mainly designed to engage the enemy's tank and other armored combat vehicles. It can also be used to destroy the enemy's defensive works technical weapon system and annihilate enemy's effective strength. The Type 59 Medium Tank is the first battle tank made in China, and the tank with the largest quantity and longest service time in service with the armored force of PLA. Specifications. Combat weight 36t. Crew 4. Max road speed 50km/h. Max range 440km." Reader comment: Based on Soviet T-54 MBT, 100mm main gun. Above-47: The Tank Museum China. Type 59 Medium Tank (China). Picture 2/4. Above-48: The Tank Museum China. Type 59 Medium Tanks (China). Picture 3/4. Above-49: The Tank Museum China. Type 59 Medium Tanks (China). Picture 4/4. Above-50: The Tank Museum China. Experimental Heavy Tank (China). Picture 1/2. "After the Jewelry Island Battle ended in 1969, forced by grim situation at that time, China began the development of a heavy tank. The first heavy tank prototype was completed in 1970. Since the design of turret was not ready when the chassis was being tested, a turret of welded armor plate was temporarily used. The development of the heavy tank was interrupted by the Culture Revolution. 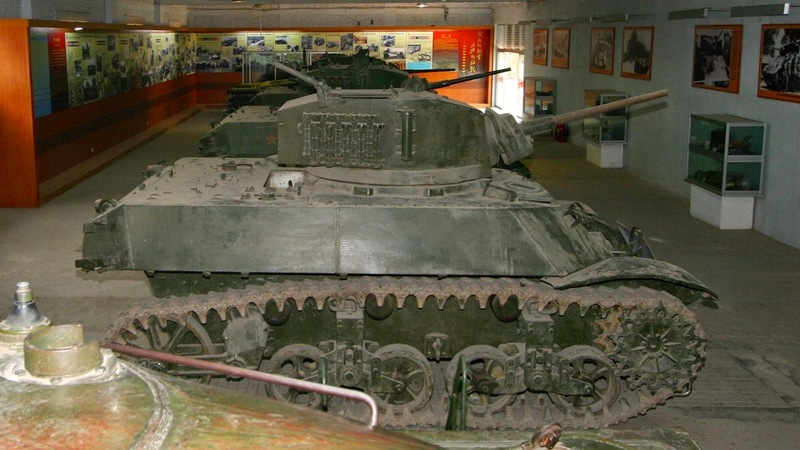 This tank is the only heavy tank in China's tank development history." Reader comment: This tank has been painted with number 304. Jewelry Island, probably meaning Zhenbao Island / Damansky Island at Chinese-Russian border on the Ussuri River. Above-51: The Tank Museum China. Experimental Heavy Tank (China). Picture 2/2. Above-52: The Tank Museum China. Above-53: The Tank Museum China. Type 59 Medium Tanks (China). Picture 1/3. Above-54: The Tank Museum China. Type 59 Medium Tanks (China). Picture 2/3. Above-55: The Tank Museum China. 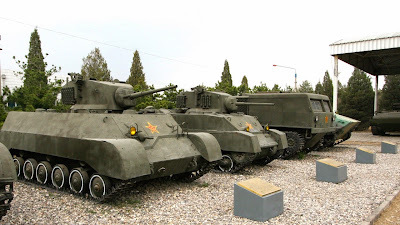 Type 59 Medium Tanks (China). Picture 3/3. Above-56: The Tank Museum China. Above-57: The Tank Museum China. Military utility vehicles. Picture 1/6. Above-58: The Tank Museum China. 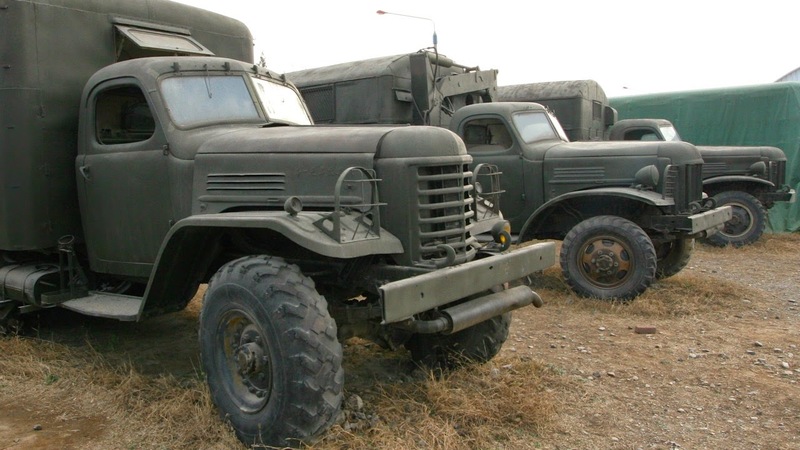 Military utility vehicles. Picture 2/6. Above-59: The Tank Museum China. Military utility vehicles. Picture 3/6. Above-60: The Tank Museum China. Military utility vehicles. Picture 4/6. Above-61: The Tank Museum China. Military utility vehicles. Picture 5/6. Above-62: The Tank Museum China. Military utility vehicles. Picture 6/6. Above-63: The Tank Museum China. Above-64: The Tank Museum China. Armoured Vehicle Exhibition Hall. Above-65: The Tank Museum China. Inside the hall. 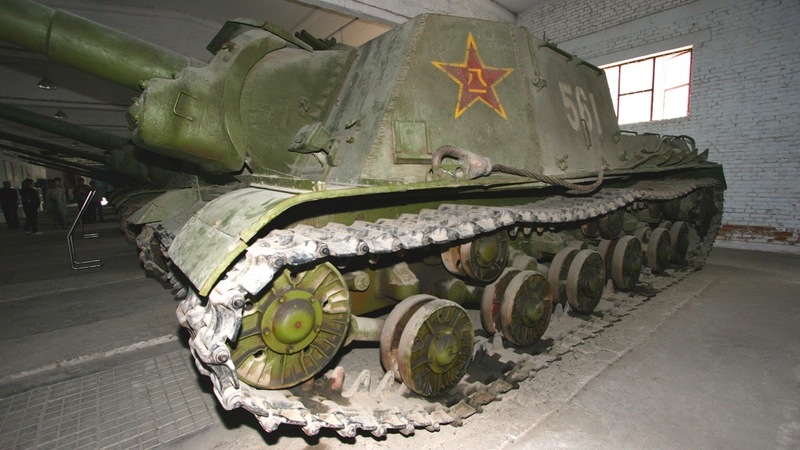 IS-2 WW2 Heavy Tank (former Soviet Union). Picture 1/2. Above-66: The Tank Museum China. 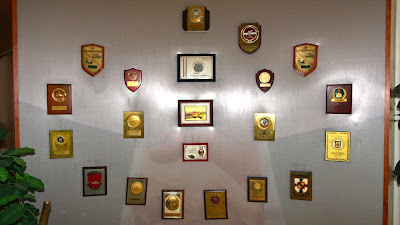 Inside the hall. IS-2 WW2 Heavy Tank (former Soviet Union). Picture 2/2. Above-67: The Tank Museum China. Inside the hall. Above-68: The Tank Museum China. Inside the hall. Type 97 Medium Tank (Japan). Picture 1/2. "Function: It is designed to destroy the enemy's armoured targets and field defensive works and annihilate its effective forces. Specifications. Combat weight 15,3t. Crew 4. Max road speed 38km/h. Max range 210km. 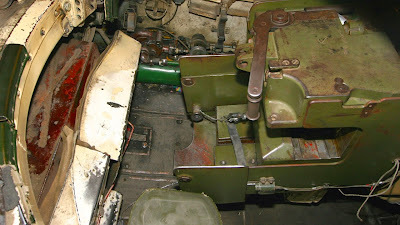 Armament (main) 1*57mm gun, (auxiliary) 2*7,7mm machine gun. Armor thickness 8-25mm." Above-69: The Tank Museum China. Inside the hall. Type 97 Medium Tank (Japan). Picture 2/2. Above-70: The Tank Museum China. Inside the hall. Above-71: The Tank Museum China. Inside the hall. Above-72: The Tank Museum China. Inside the hall. Type 59 Medium Tank (China). Picture 3/4. Above-73: The Tank Museum China. Inside the hall. Type 59 Medium Tank (China). Picture 4/4. Above-74: The Tank Museum China. Inside the hall. M5A1 Light Tank (United States). Reader comment: Not a Japanese Type 95. This is M5A1. Above-75: The Tank Museum China. Inside the hall. M5A1 Light Tank (United States). Picture 1/3. Above-76: The Tank Museum China. Inside the hall. M5A1 Light Tank (United States). Picture 2/3. Above-77: The Tank Museum China. Inside the hall. M5A1 Light Tank (United States). Picture 3/3. Above-78: The Tank Museum China. Inside the hall. CY-100 Medium Self-Propelled Gun Tank (former Soviet Union). "It is designed accompany the infantry and armor in the battle, to provide fire support and destroy the enemy's armored vehicles. Specifications. Combat weight 31,6t. Crew 4. Max road speed 55km/h. Max range 300km. Armament (main) 1*100mm cannon. Armor thickness 20-90mm." Above-79: The Tank Museum China. Inside the hall. Picture 1/2. 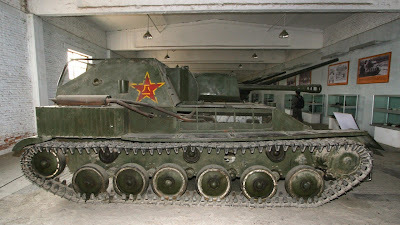 SU-76 Light Tank, Self-Propelled Gun (former Soviet Union). Reader comment: SU-76 Samokhodnaya Ustanovka self-propelled gun. Above-80: The Tank Museum China. Inside the hall. Picture 2/2. Reader comment: SU-76 light SPG, not ISU-122 Heavy SPG. 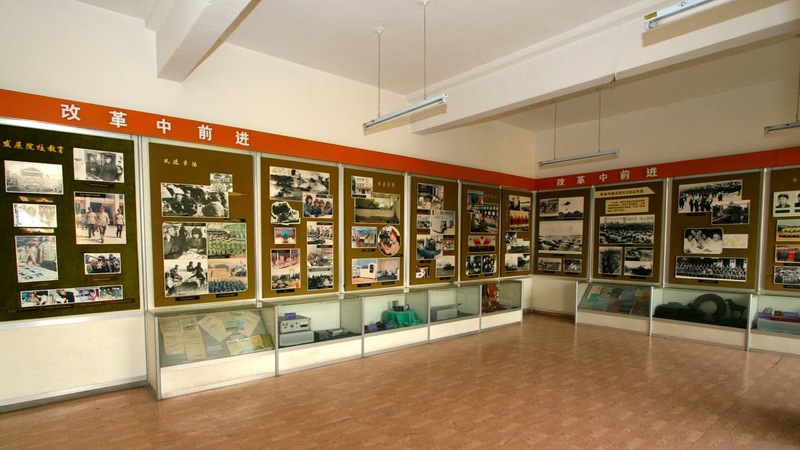 Above-81: The Tank Museum China. Inside the hall. M3A3 Light Tank (United States). "Function: It is designed to destroy the enemy's armored targets and field defensive works and annihilate its effective forces. This light tank was captured from Indian Army in the war of 1962 between China and India. Specifications. Combat weight 14.1t. Crew 4. Max road speed 56km/h. Max range 175km. Armament (main) 1*37mm gun, (auxiliary) 3*7.62mm machine guns. Armor thickness 25.4-38mm." 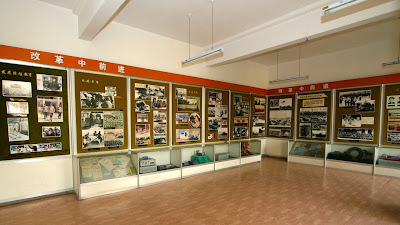 Above-82: The Tank Museum China. Inside the hall. 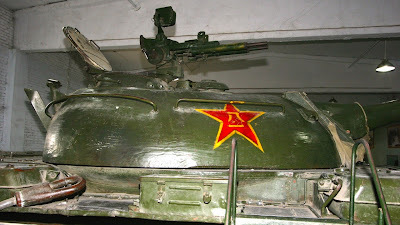 Detail of CY-122 from former Soviet Union. Reader comment: SU-122 Samokhodnaya Ustanovka self-propelled gun. Above-83: The Tank Museum China. Inside the hall. CY-152 Heavy Self-Propelled Gun (former Soviet Union). Picture 1/2. "Function: It is designed to accompany the infantry and amor in the battle to provide fire support and destroy the enemy's armored vehicles. Specifications. Combat weight 46t. Crew 5. Max road speed 37km/h. Max range 220km. Armament 1*122mm cannon/howitzer. Armor thickness 20-150mm." Reader comment: SU-152 Samokhodnaya Ustanovka self-propelled gun. 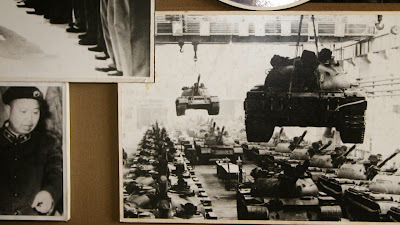 Above-84: The Tank Museum China. Inside the hall. CY-152 Heavy Self-Propelled Gun (former Soviet Union). Picture 2/2. 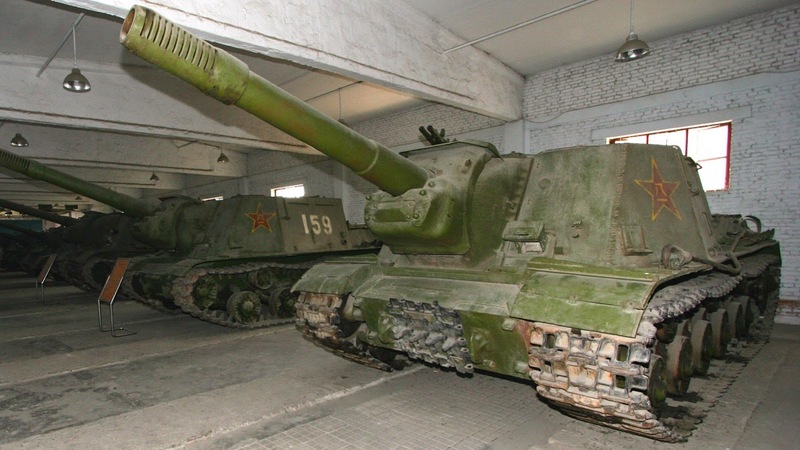 Two tank halls had also CY-76M from former Soviet Union, Type 94 Medium Tank from Japan and a few other tanks. SU-76M, SU-152, Samokhodnaya Ustanovka self-propelled gun. Above-85: The Tank Museum China. Inside the hall. Above-86: The Tank Museum China. Above-87: The Tank Museum China. 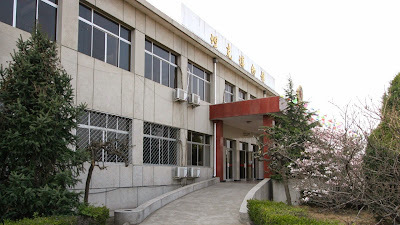 The main building. Exhibition rooms on 2nd floor. Above-88: The Tank Museum China. The main building. Exhibition rooms on 2nd floor. Photos. Above-89: The Tank Museum China. The main building. Above-90: The Tank Museum China. The main building. 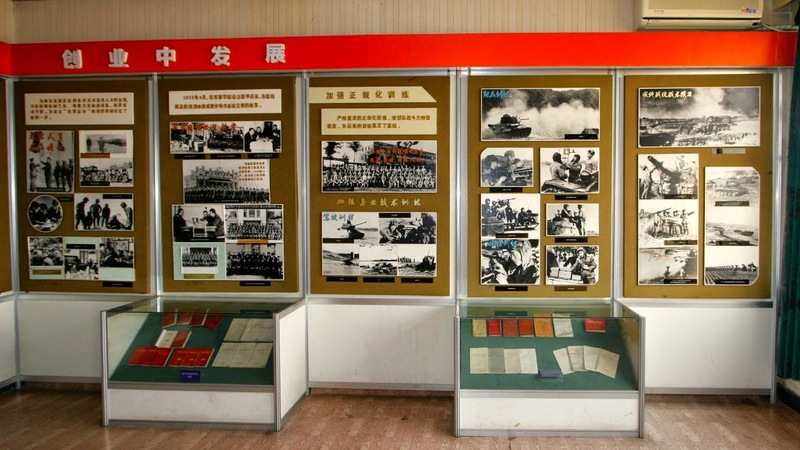 Above-91: The Tank Museum China. The main building. Above-92: The Tank Museum China. The main building. - Tong Zhi Men Xin Ku Le! - Comrades, you have done a hard job! - Wei Ren Min Fu Wu! - We Serve The People! Above-93: The Tank Museum China. The main building. Above-94: The Tank Museum China. The main building. Above-95: The Tank Museum China. The main building. Above-96: The Tank Museum China. The main building. Exhibition rooms on 2nd floor. The spade. Picture 1/2. Above-97: The Tank Museum China. The main building. Exhibition rooms on 2nd floor. The spade. Picture 2/2. Above-98: The Tank Museum China. The main building. 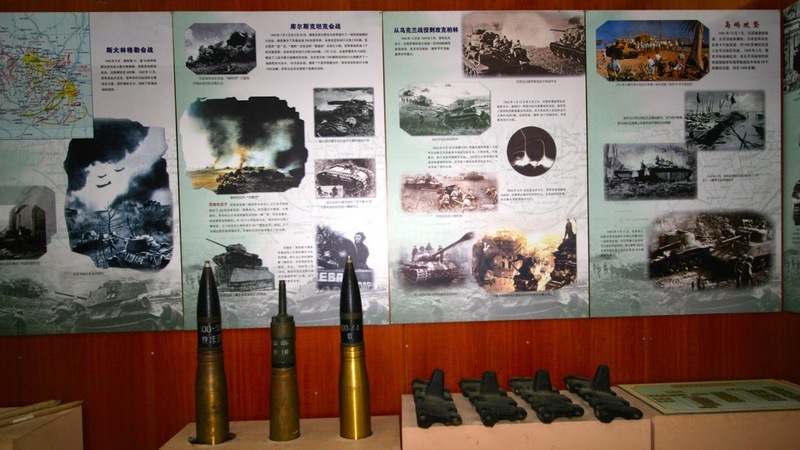 Above-99: The Tank Museum China. The main building. Above-100: The Tank Museum China. The main building. Exhibition rooms on 2nd floor. Wooden samples. Above-101: The Tank Museum China. The main building. Above-102: The Tank Museum China. The main building. Above-103: The Tank Museum China. The main building. View from exhibition room on 2nd floor. 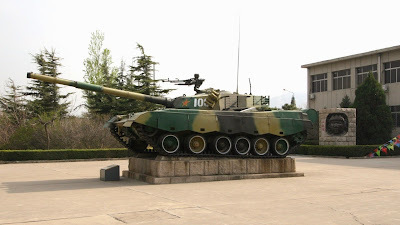 Type 96 Main Battle Tank (China) at museum's gate. Above-104: The Tank Museum China. The main building. Above-105: The Tank Museum China. In front of the main building. Type 96 Main Battle Tank (China). Above-106: The Tank Museum China. Above-107: The Tank Museum China. Side building. Above-108: The Tank Museum China. Side building. 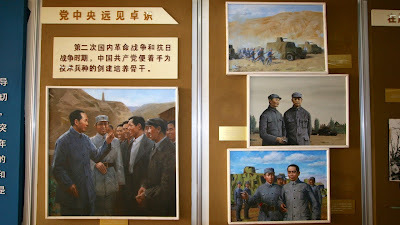 Above-109: The Tank Museum China. Side building. Motor Scout, the first armed petrol engine powered vehicle ever built. It was designed and built by British inventor Frederick R. Simms in 1898. He mounted a standard Mark IV Maxim machine gun above the front wheels of a quadricycle. Above-110: The Tank Museum China. Side building. Above-111: The Tank Museum China. Side building. Above-112: The Tank Museum China. Side building. Above-113: The Tank Museum China. Side building. Above-114: The Tank Museum China. Side building. Above-115: The Tank Museum China. Above-116: The Tank Museum China. 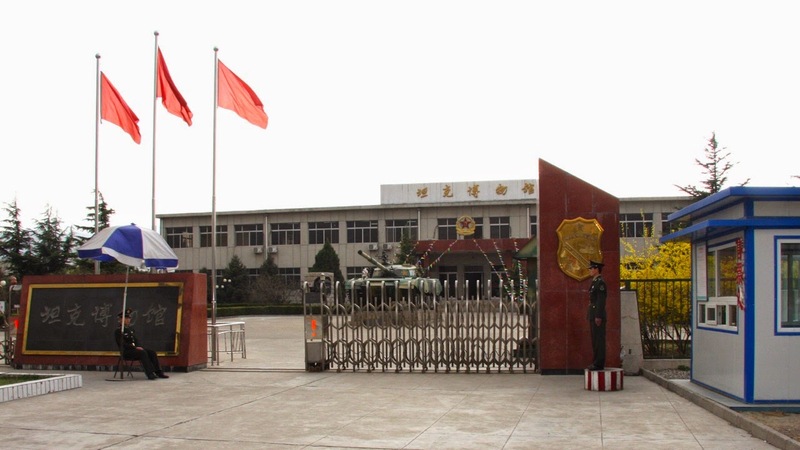 Above-117: The Tank Museum China. In front of the main building. Above-118: The Tank Museum China. Gate. Above-120: Badaling Highway, turbo-speeding towards Beijing. I am not an engineer but seeking 'tank magic'. Tank Museum China was weirdly refreshing experience. It made me think of my red, hot espresso machine LaSpaziale, grind-on-demand grinder Mahlkönig and Italian roasted beans. Hmm. Hi, great post, very informative. I visited the Beijing Tank Museum in September and have used your page as well as others to identify the tanks in the pictures I took. A few notes and corrections on identification: picture 18 is a Type 63-I Light Tank and picture 74 is not a Japanese Type 95, it is an M5A1, as is the following tank you asked to identify. They are the same type, but with different skirting around the tracks. Take a look at the similarities in the turrets. The one misidentified as a Type 95 Japanese tank has a wooden stick for a barrel! thank you for the info, I added Type 63 to picture 18. And M5A1 to pictures 74-77. Long time mystery got finally solved!